Celebrate Memorial Day Weekend at Hacienda Mar de Cortez. Saturday: live entertainment and pot roast. 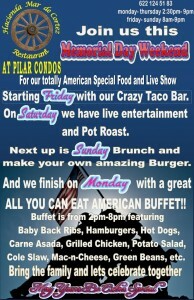 Monday: delicious all-you-can-eat American Buffet from 2:00pm – 8:00pm. Bring the family and celebrate at Hacienda Mar de Cortez in Pilar Condominiums.